Adding drawers, shelves, rods and more to your closet can transform your dishelved closet into an organized space. In many Valley households, the approach of fall triggers a frenzy of action comparable to spring cleaning in other climates. When the mercury finally shows signs of backing off after another long, hot Arizona summer, Phoenix residents seem to be energized by the promise of cooler weather as much as Northerners are by the sight of melting snow. Deep cleaning, tackling home repairs and organizing storage spaces are all on the agenda. Summer things are put in storage, while fall wear and school clothes for the kids come out. 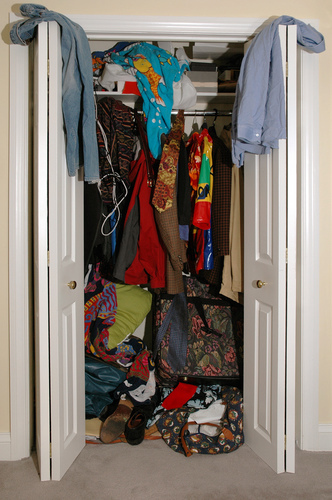 After much sorting, rearranging and repacking, many people come to the conclusion that their closets simply aren’t big enough to hold all that stuff. Often the real problem, however, is that most closets just were never built in a way that uses the space most efficiently. With the high cost of adding storage space to a house or renting an off-site storage unit, closet remodeling can be one of the easiest, cost-effective home improvement projects. A skilled carpenter or cabinetmaker can assess your storage needs with you and install just the right combinations of added shelves, drawers, racks, rods and hooks to customize your cookie-cutter closets into ones that suit your life exactly. Another option to consider, as long as you’re having your closets rebuilt, is to have cedar closet linings installed in them. Cedar panels or planks give closets a wonderful, natural scent and are resistant to both mildew and insects such as moths and silverfish. 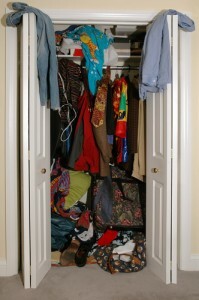 Remodeled closets have immediate benefits to the homeowner. Daily living is more efficient and less frustrating when you stop wasting valuable time hunting for buried items, re-ironing wrinkled clothes, etc. In addition, other areas of your home will be beautified as more of the unsightly clutter scattered about can now be stored out of sight in your revamped closet. Down the road, if you’re ever looking to sell your house, potential buyers will be impressed by the additional storage space your house offers over those with run-of-the-mill closets. The Happy Handyman can work with you to remodel your closet into an orderly, organized storage space for your clothes, shoes and accessories. We install closet linings, too! Call us for a free quote at 888-922-9918 or 480-216-2750. Happy Home Services LLC DBA The Happy Handyman (ROC # 294071) - Phoenix Metro Area 480-216-2750 Copyright © 2010-2014 The Happy Handyman - All Rights Reserved.